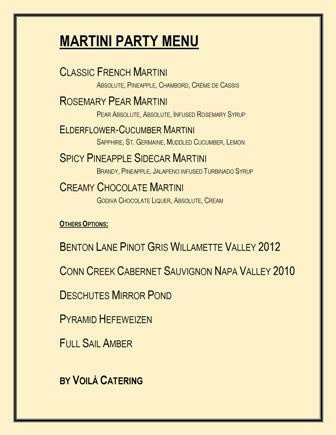 Voila Catering has been providing bartending and beverage service since 2001 in Portland Oregon. More than just providing the best food possible, we also provide mobile bartending at your special event. Combine amazing gourmet food, innovative chef-inspired cocktails, affordable wines, elegant party rentals, and all your party guests will be thrilled with the success of a smoothly run event! In addition to these delightful mixed concoctions from our bartenders, we also can provide the perfect wine and micro-brew selection for our special event. Learn more about our beer, wine, and beverage service on our Drinks Page!